Unite, the UK’s largest union, and pladis, the global biscuit and confectionery company behind the iconic McVitie’s brand, have signed an Engineering Apprenticeship Agreement in the UK. The agreement sets the gold standard for apprenticeships and by 2020 the partnership will have enabled close to 50 new apprentices to be recruited into engineering roles at pladis. This UK Engineering Technician Apprenticeship Programme runs for five years and takes place across pladis’s seven sites up and down the country. Pladis produces some of the UK’s bestselling biscuits including McVitie’s Digestives, Jaffa Cakes, and Jacob’s Cream Crackers. The apprentices will receive comprehensive training in the repair and maintenance of a wide range of packaging and processing equipment under the mentorship of highly skilled and experienced engineering employees and Unite members. The jointly negotiated agreement recognises Unite as the only trade union with which the company will consult on all matters relating to its engineering technician apprentices. On 6 April 2017, the government’s apprenticeship levy came into effect: all companies with a pay bill over £3 million per annum are required to pay the levy which is 0.5 per cent of their employees pay. The government’s levy aims to meet their target of creating three million apprenticeships by 2020. 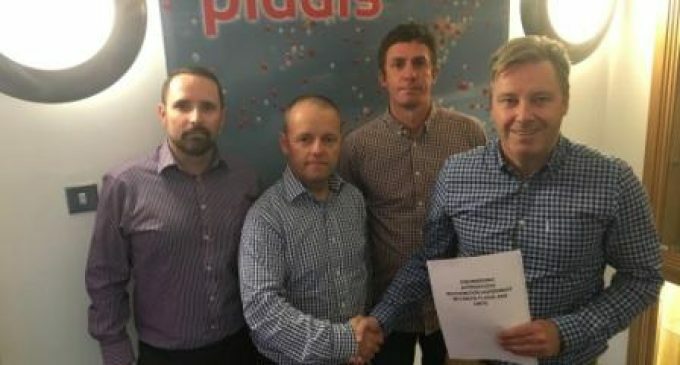 Pictured (L to R): Jonathan Simpson, HR Business Partner, pladis; Neil Smith, Head of Manufacturing HR, pladis; Matt Gould, Unite representative, pladis; and Rhys McCarthy, Unite national officer.